It constitutes a great joy and a profound blessing to be together again for our 8th annual General Assembly. Many of us have known each other not only since our First Episcopal Assembly in May 26-27, 2010, but long before. 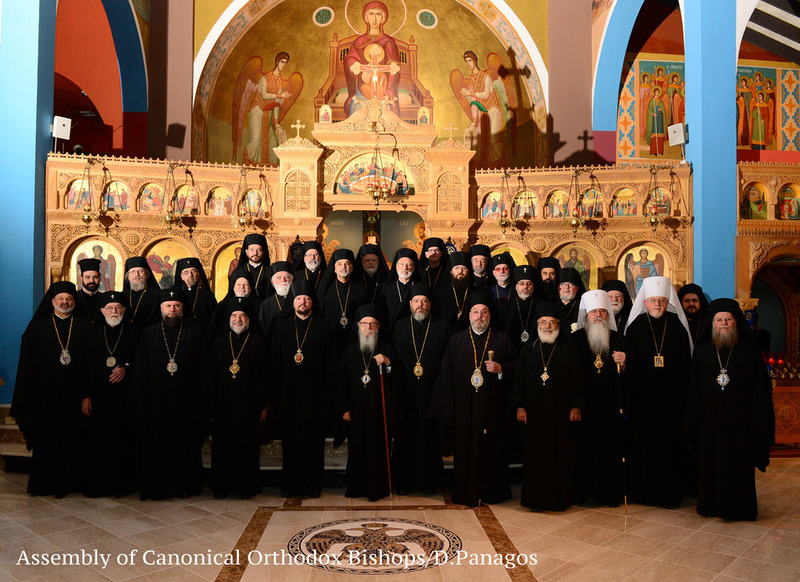 Our eight General Assemblies, however, have been special occasion for cultivating and strengthening the bond of deep love and apostolic zeal that unites us as canonical Hierarchs of the one, holy, catholic and apostolic Church in America. Through God’s grace and providence, we have all been brought together to this one place and we have been called to walk in unison toward a common goal, albeit, one that is still unfolding and which will be fully revealed in the eschaton. While our sights are ultimately set on the “things to come and longed for,” as long as we call ourselves co-laborers in God’s vineyard, it is our sacred obligation to work together to realize this goal by drawing ever-closer to one another. This leads us to pay greater attention to the purpose of our meeting. Let us consider some basic points. The first point related to the purpose of our Assembly is something self-understood. We are here to increase the love for each other, and to enhance our unity in Christ. This is a noble purpose in and of itself, but it also has a decisive impact on our work in presenting an authentic witness of Orthodoxy. Before His betrayal, arrest, imprisonment, crucifixion and death on the Cross, the Lord Jesus Christ reminded His disciples that when He is gone, the only way that the world will recognize that they are His disciples is by the love they have for one another. As you know, He said to His disciples, A new commandment I give to you that you love one another even as I have loved you that you also love one another. By this all people will know that you are my disciples if you have love for one another (John 13:34-35). At the same time Christ prayed to His Father: Father I do not pray for those only but also for those who will believe in me through their word, that they all be one even as You, Father, are in me and I in You, that they also may be one in us so that the word may believe that You have sent me (John 17:20-21). It is not simply that people will call themselves “Christians” that the world will know that they are followers of Christ. Only by their love – their sacrificial love – for one another and their unity in Christ will the estranged world pause and recognize in them the very light and life emanating from Christ and His Gospel. This unwaining light, which is present in the hearts, thoughts, and actions of love of true disciples of Christ, moves young and old to discover Jesus and to quench their spiritual thirst with His living water. Our work together is, therefore, a methodical and intense spiritual exercise in building love and fortifying the bond of our unity in Christ. Such a sacred task, as it happened today, starts and is perfected by our participation in the life-giving and unifying Cup, in the vivifying Body and Blood of Christ, in the Holy Eucharist. Our Liturgy today gave us the superb blessing of experiencing love and unity in Christ. I would like to personally thank our brother Metropolitan Evangelos of New Jersey, who eagerly and with great joy offered his parish of Saint George in Clifton, NJ, as the location for our opening Divine Liturgy. On this occasion, I also thank him for extending to us the assistance and service of his Metropolis staff and clergy, and for offering an Abrahamic hospitality to us all. I should like also to express our gratitude to Bishop Basil and Metropolitan Antony for their untiring labors as Secretary and Treasurer, respectively, offered graciously to the Assembly. Their successors for the past year, since the last Assembly, Bishop Gregory and Archbishop Michael, have already shown remarkable zeal in performing their duties. Additional gratitude is offered to Bishop Maxim for coordinating the work of the Committees for the past seven years, and to the Presidents and members of our Committees. The second point I should like to make is that the purpose of our coming together as members of our Episcopal Assembly of the United States is also our sacred duty as Hierarchs to organize and function according to the canonical norms and tradition that our Church Fathers wisely established throughout the centuries. It is our responsibility to walk according to the canonical prescriptions of our Church because these common ordinances help steer us and the faithful on the path to salvation. Our meeting, therefore, serves also as an opportunity to discover the challenges that force us to deviate at times from this path. Of course, our work and discussions around this matter have not been easy over the years. We have not always agreed on how we ought to proceed with our internal organization and functioning. There have even been times when we thought that we have made important breakthroughs only to realize that we have far more work ahead of us than we ever could foresee. And while a consensus view of how Orthodoxy should be organized in the United States still evades us, we are most confident that by constantly investing our time and energy in the process, there will one day be enough room in our hearts to allow the Holy Spirit to lead to a spiritual and fruitful outcome. To this end, I offer special thanks to the Lord for the work of His Eminence Metropolitan Nicolae, who, together with the members of the Committee for Canonical Regional Planning, continues to study and present to us possible ways to enhance the way we function and organize ourselves as an Orthodox Church. Dear brothers, if we are not committed to getting our own house in order; if we cannot find more effective ways to preach the Holy Gospel; if we have difficulties being patient with each other, then, what image of Christ and His Church are we sharing with the world? How can we expect the world to take refuge in the Arc of Salvation—the Church—when the image of the Church that is often publicly portrayed is that of disharmony? My third and final point is the care for the Youth. Our purpose of coming together is to work on an authentic and common witness of Orthodoxy to the younger generation. Certainly, a very important reason for us to gather each year from near and far for our annual assembly is the generation that still views the Church as their future and salvation. We often hear that the youth is the future of the Church, but there are so many young and emerging adults who look for a Church that is their future. Statistics show that there is a decline in the religious and spiritual lives of young people, but this does not mean that we can simply give up on those who struggle each day, longing for greater meaning in life than that offered to them by a society that is largely materialistic. We must also not give up on our children who have found Jesus Christ but struggle to recognize Him in their daily lives. During the next few days, we will listen to presentations by Dr. Richard Flory and Dr. Ann Bezzerides who will offer us insights into the cultural trends affecting the Christian identity of our young people. They will explain to us in concrete terms what is not working, but will also highlight success stories across the US religious spectrum. We will also have the opportunity to watch a very intriguing video produced by Ancient Faith Films of the Antiochian Archdiocese, which portrays the thoughts and beliefs of the so-called “nones,” or the disconnected—those young men and women who, without being atheists, prefer not to be associated with any official religious community. And all this will hopefully allow us, dear brothers, to ask ourselves whether we are part of the problem and if we are prepared to be part of the solution. Does our conduct help people find Christ when they look at us? Do we truly love one another or are we still allowing grudges and agendas of various forms to stand in our way to connect to each other? How can we help young men and women understand that leadership requires sacrifice and service if we are not prepared to serve and sacrifice for each other? My beloved brothers and concelebrants, as we convene for our work in New Jersey— let us not forget that this State is often referred to as the “Garden State.” America recognizes New Jersey for its fertile soil, soil that bears great fruit and provides sustenance to millions of people. It is my wholehearted prayer, that just as the rain and sun nourish the fruit brought forth from this soil, our merciful God may water our souls, and shine upon our minds, enabling us to understand and fulfill the Words of Christ, Who said to His disciples, I chose you and appointed you that you should go and bear fruit and that your fruit should abide (John 15:16). Amen.